ST. GEORGE — Nothing beats falling in love for the first time. The aching pain for another being that sends the mind racing at night. Suddenly, sunsets seem to sparkle in a richer hue. Love enhances the ordinary dregs of life with a glowing warmth. But, what is love really? Does it change over time? In our world of advancing technology and search for the theory of everything, science attempts to explain the mysteries of the everyday life. Yet, when it comes to emotional connections, feelings of uncontrollable lust for another human, what’s science got to do with it? Or, better yet, what’s love got to do with it? Those first feelings of falling in love are unforgettable. Symptoms include flushed cheeks, sweaty palms, a thumping heartbeat, and an inability to think of anything besides that special person – symptoms that can last from a few weeks to a couple years. From a scientific perspective, we are at the mercy of these uncontrollable reactions all thanks to the production of some hormones. While the topic of human pheromones is likely to pop up in casual conversation as an explanation for our attractions toward certain people, they are not very well understood and probably don’t have big impacts on our behavior, Dr. Curt Walker said. Walker is a biology professor at Dixie State University. 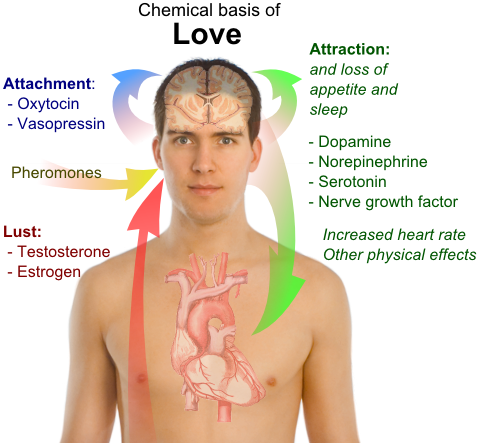 While the actual effect of human pheromones on us is still indiscernible, a more established substance in love processes, Walker said, is oxytocin — a hormone that travels through the blood from the pituitary gland in the brain and is produced through stimulus of the senses, such as touch and in childbirth. Oxytocin is produced when hugging, kissing and, well, you get the idea. Oxytocin also induces the uterus to contract in childbirth and promotes bonding between the baby and the mother when the baby nurses. A Freudian concept was that babies fell in love with their mothers because they provided food; but that’s not the case at all, Dr. Dannelle Larsen-Rife, department chair for the social and behavioral sciences at DSU, said. Attraction appears to be some kind of chemical attraction, Larsen-Rife said. We are more attracted to someone who is genetically dissimilar to us. The idea behind that, from an evolutionary perspective, is that if we don’t share the exact same genes, our children are more likely to survive because they get a greater variety of genes. 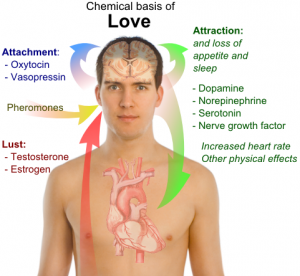 When people first become attracted to each other, a big surge of dopamine releases in the brain, producing pleasure. That’s the passionate type of love, and that phase doesn’t last that long, Larsen-Rife said. That intense feeling lasts as few as three months for some people, and for others it lasts for a couple years; but, for most, within a few years it changes into another kind of love — more of a compassionate type of love, Larsen-Rife said. Passionate love is fleeting. Just like anything, love evolves culturally. In United States culture, we think people should enter a relationship when they are in love and exit a relationship when they are out of love, Larsen-Rife said. But, historically, marriage was not about love, she said; it was about economics and raising children. The idea of love and how we practice love has changed through consumerism. Love being described in terms of Hallmark cards and cliché memes and acknowledging your partner one day of the year by buying consumer stuff is not love, Rev. Dr. Joel Lewis, chair of the history department at DSU, said — and it is not how people have traditionally interpreted love. Traditionally, love, as a concept, goes back to the very dawn of civilization. It’s not just an expression of two human beings and an emotion they feel for each other, he said; it’s the manifestation of the entire human experience. There’s a reason why all the major religions — if you boil them down to their description of God— always comes down to the idea of love, Lewis said. It’s an outlook on the outer world and a connection between two humans. The real shift in love came in the 1920s, around the time of the birth of advertising agencies. Ad agencies redefined what it means to be beautiful and what it means to be worthwhile as a human being, Lewis said. Ads create a false image of reality in people’s heads and breed low self-esteem inside young women, because they don’t realize those images are fabricated and no woman can ever live up to them. Love is why people wake up in the morning. It’s not just about one person, either. Love is the way that you look at the world. If you’re a person who truly reflects love, you don’t need holidays. To be in love is, you take that one person and you say, ‘Out of all the billions of people on this planet, I choose you above all others.’ It’s not two people merging into one. It’s two people choosing to walk a path side by side, saying there’s a lot of other paths I can take but I choose this. Being in love is hard, and keeping that alive is a daily struggle. When people boil it down to Valentine’s Day and things like that, it’s the opposite of love. It’s mass marketing — shallow and hollow. The chemistry between two people or two objects is referring to how they react together, DSU chemistry professor and Vietnam veteran Dr. Ken Piles said. If you get along, or if there is a mutual benefit, then you have good chemistry. But chemistry can fall apart. Piles has been married 48 years and said marriage is not always easy. Too often, he said, it’s easier to walk away than stay and communicate with your partner and figure things out. The key is communication. I didn’t read the whole article because what I did read sounds like obsessive lust.